Jaw and neck pain are generally speaking caused by what is referred to as musculoskeletal pain meaning originating in the joints or muscles. Some neck pain is caused by other issues such as nerve entrapment, this does not however happen in the jaw. Musculoskeletal pain can be relieved or improved by the use of simple exercise therapy either done by the patient or by a physiotherapist. Although physiotherapy can be very beneficial in neck and back pain it has little or no benefit in the management of jaw pain. There is a close link between musculoskeletal pain occurring in the jaw with that in the neck and for this reason patients who essentially have a jaw problem may be advised to either use neck exercises or have neck physiotherapy as the neck or shoulder problems where not treated may continue to aggravate a jaw problem. It is likely that part of the reason that we tend to suffer from long-term or chronic musculoskeletal pain in the jaw, neck, shoulder and back area is due to the fact that all these areas consist of muscles which are involved in maintaining correct posture. For this reason these muscles have a high number of different muscle fibres than other muscles and this may make them more prone to simple injury. Poor posture may lead to or aggravate muscle pain in some individuals and certainly we are aware that correct seating posture may be important in those with neck and back pain although not directly in jaw problems. Jaw posture is different in that we do not need to necessarily hold our jaw in a certain position, but rather simply avoid having top and bottom teeth touching except when eating or sleeping, the latter being a time when we have no control over jaw activities. In other words in our relaxed jaw position there is a gap of 2-3mm between our top and bottom teeth. The size of this gap is not important but rather that the teeth do not touch. It often is surprising to some individuals that teeth-apart is our normal resting and relaxed position for our jaws. Having teeth touching, just like not maintaining good seating or standing posture is not necessarily a problem and most with poor posture of any type do not have problems. Back and jaw posture is probably only a problem for those who have a predisposition to pain or problems in either area. 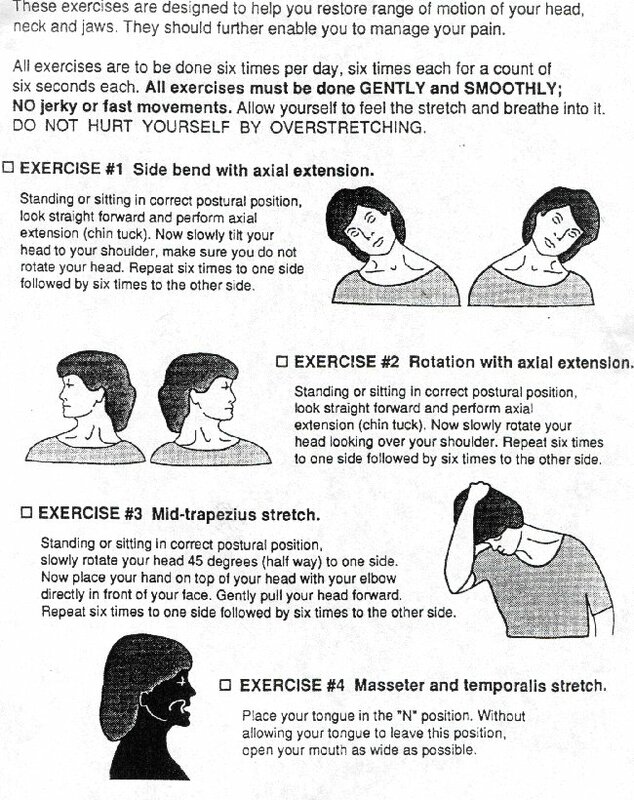 The rest may have very poor posture without ever having a problem. Just as poor posture may be a factor in neck and back pain, so teeth held together for prolonged periods may lead to tension in the jaw muscles caused by need for the jaw muscles to have to maintain a mildly contracted state to close the jaw the few millimetres from the relaxed “jaw hanging open” position to the fully closed teeth together position. Jaw muscles are designed for chewing which involves rapid repeated contractions to bite and crush food over a relatively short period. Constant sustained albeit light contraction is not something they are designed for and it can cause a tightness or pain, which may in turn contribute to injury within the joint itself over time. It is likely that neck muscles if developing problems in themselves can cause a knock-on affect in the adjacent jaw muscles or joints. In the opposite fashion jaw clenching may upset the balance in the neck and upper back giving rise ultimately to pain there in some individuals. In these patients treatment of the underlying jaw problem may be required to bring relief to their neck issues. In brief good jaw posture is as simple as not allowing the teeth to touch. It is a simple “exercise” or self-help and in some can have a very important role to play in controlling jaw pain and to a lesser extent neck and back pain. A tooth-apart position is the simplest “exercise” those with jaw pain can do and is often very effective. In its simplest form physiotherapy involves stretching of painful or damaged muscles. The simplest jaw exercise involves stretching the jaw open to a comfortably wide position. This is a position that involves wide opening but no stretching open to the maximum. In those with sore jaw muscles it may give rise to a feeling of tightness or pain in the muscles. This is a good indication that the stretching is sufficient to affect the muscles, hopefully in a positive way. The jaw should be held in this comfortably wide position for a count of 5 or 6 seconds and then the jaw is allowed to relax (without teeth touching) for a few seconds or longer if necessary and the exercise repeated 5 or 6 times, ideally every two or three hours throughout the day. This is a simple procedure which can be done during daily activities without inconvenience. Where muscles are painful heat will often relieve the pain even if only temporarily. The jaw muscles are no exception and a simple way of heating muscles is by using hot water bottles filled with boiling water. In order to avoid burning the skin surface a large towel should be wrapped several times around the hot water bottle. It is believed that “moist heat” is more effective than dry heat and for this reason the towels may be soaked in water and wrung out before placing them in a microwave for a minute on high temperature, these in turn are wrapped around the hot water bottles and in turn may be covered with a dry towel to avoid burning. The heat to be effective and penetrate deep into the body of the muscle may need to be held in place for ten minutes. Stretching may be done in conjunction with the heating and may be done intermittently for a minute at a time once the muscles have warmed up. An effective mode of treatment would ideally have two heating and stretching sessions at either end of the day with simple series of 5 or 6 stretches done at intervals during the day with heat not been required at these times. This pattern can be used for a period of two to three weeks by which time it can be reduced to hopefully maintain any improvement. Or if nothing has happened it is abandoned as unhelpful. Some would advocate jaw stretching whilst placing the tip of the tongue lightly behind the upper front teeth on the gum at the front of the palate or roof of the mouth. This is the position the tongue is in when saying the letter “N” and this position is a way of avoiding over stretching. Although stretching of sore muscles can lead to pain this is to be expected and accepted in the first days. Any significant pain or sense that the jaw is jamming should be used as a warning and the exercise stopped as where the joint itself is painful, exercise may aggravate the situation. Joints that click when the jaw is opened may become painful when exercised and should be avoided. 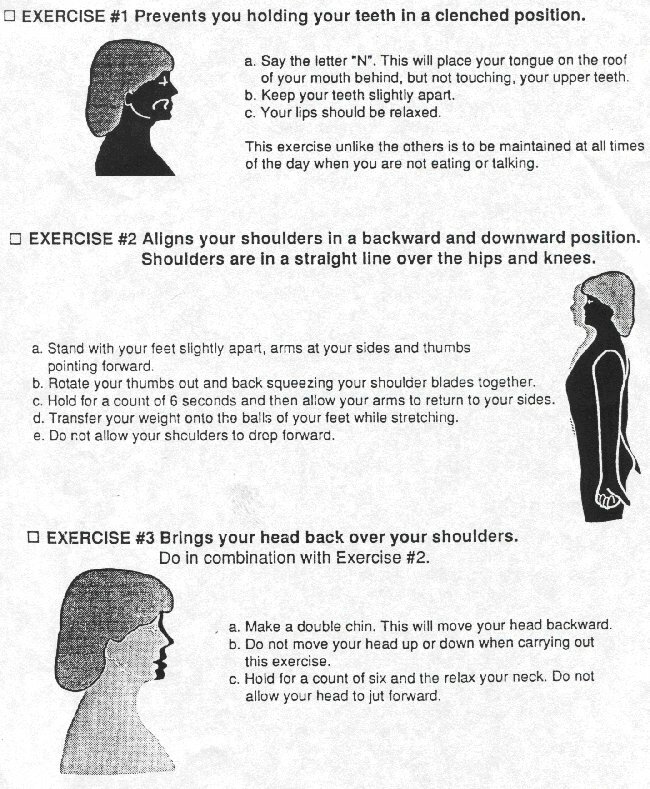 The following are some useful physiotherapy guided exercises which may help in those with jaw and particularly neck pain. As with all exercises caution is always advisable and any sense that the situation is deteriorating rather than improving show lead to discontinuation of the exercises. 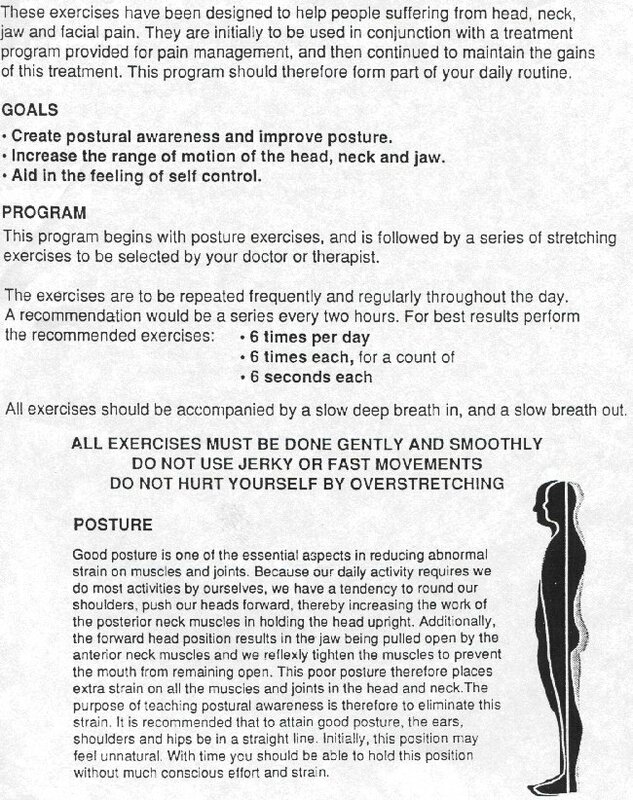 The exercises involve simple stretching. It is felt that injured muscles should not be subjected to loading such as in strengthening type exercises at least in the earlier stages.